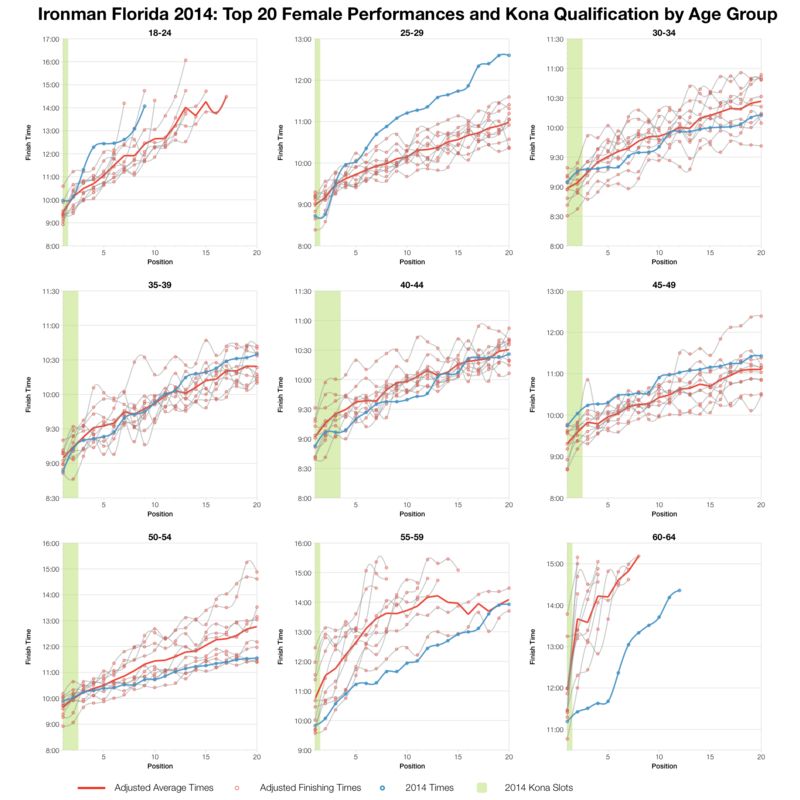 Conditions at this year’s Ironman Florida were sufficiently poor on race morning that organisers were forced to cancel the swim and to instead start athletes on the bikes. An unfortunate beginning to the day, but the race went on. Naturally, without a swim finishing times at the 2014 race were faster than those from previous years – a direct comparison isn’t possible. The best I can do is to look at bike and run splits to give a degree of insight into this year’s race. 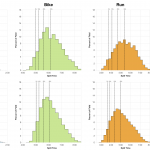 The same conditions that resulted in a cancelled swim also made for a tougher bike with slower median splits across most age groups. 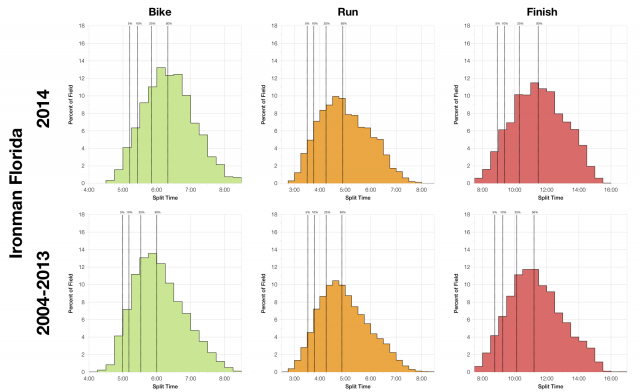 Athletes may have been a little fresher at the start of the bike (depending on how much the wait affected them), but the high winds on race day are clearly present in their splits. 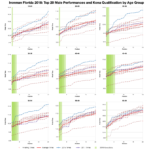 The run however is more comparable with previous years, perhaps a touch faster in some male age groups. If I compare distributions with the finishing splits from previous races adjusted to remove the swim we see that the 2014 finishing splits actually trend slightly slower than previous years. It’s also clear that most of this is the result of the significantly slower bike in this year’s event. 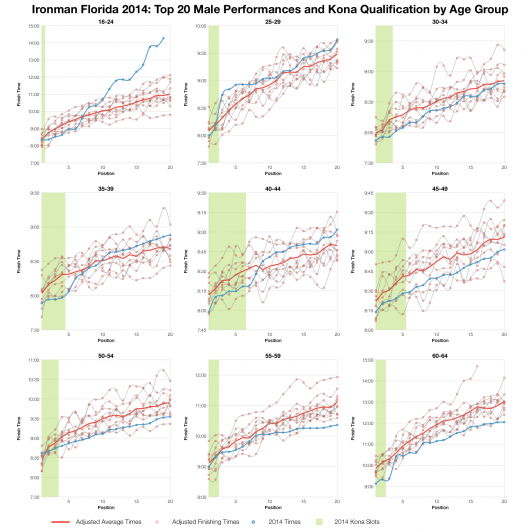 So while the 2014 finish times are faster on paper, had the swim gone ahead I’d expect this year’s race to be at the slow end of Ironman Florida events. 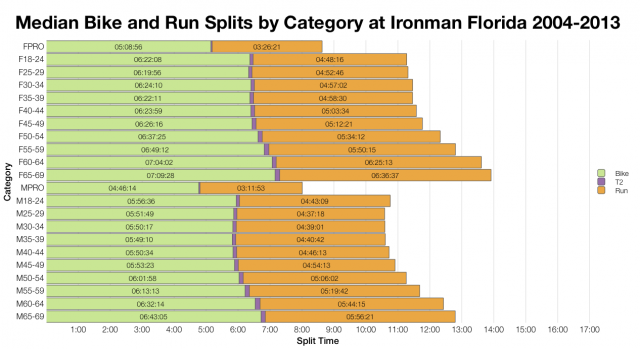 To compare performances at the front of the age group pack I’ve again adjusted older finish times by removing the swim. 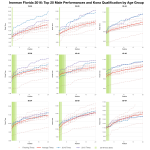 Tracing the results for previous years after this adjustment shows how a poor swim can affect qualifying chances – there are instances where athletes finishing in 5th-10th would have placed in 1st-3rd on bike and run alone. 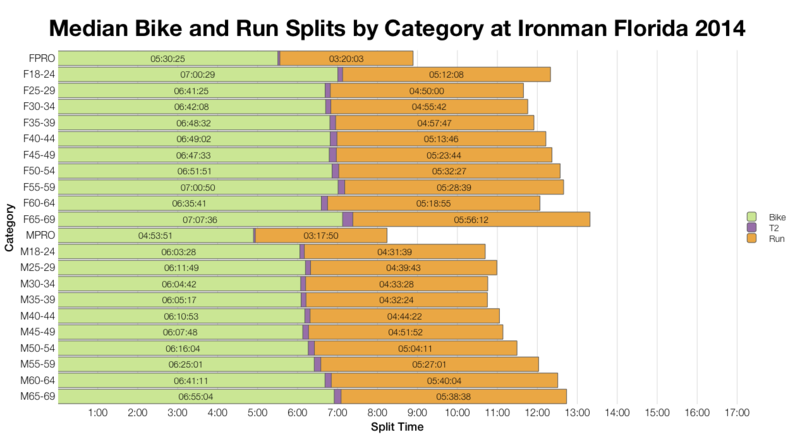 Comparing the swim-less average times against this year’s results doesn’t give the clearest of patterns, but there are sufficient age groups where the latest results trend faster that I suspect the front of pack were less impacted by the conditions and alterations to race day. 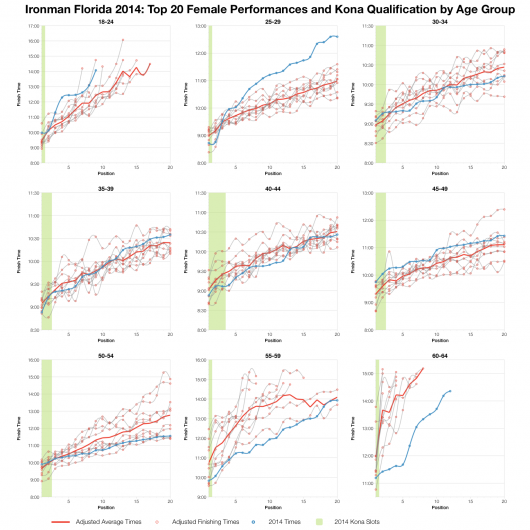 A tough year at Ironman Florida, both the disappointment of losing the swim and the challenging conditions that caused it. Times may not be directly comparable, but the evidence suggests it was a slower year at the race. As usual I’ve put a spreadsheet of the full results and splits from Ironman Florida 2014 on my Google Drive.